I was cruising the web last night looking at this crazy mud run called Mudsanity, when I saw this picture on their Facebook wall, so I had to borrow it. 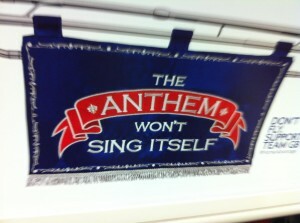 And it’s correct, the Anthem isn’t going to sing itself – get up , get out and get to work. and dont’ let the rocks do your job for you! Enter your email address and have the Buffet delivered daily to your inbox! © 2019 Daily Buffet · Proudly powered by WordPress & Green Park 2 by Cordobo.